Robinson’s goal was to create an attraction that would bring people from all over the country to visit. He hired sculptor, Gutzon Borglum (at the age of 60), who was working at the monument at Stone Mountain, Georgia. It was Borglum who identified the exact location for this rather grand monument. Meanwhile, Robinson worked with President Coolidge and others to get Congressional support and funding. The original plan was meant to honor pioneers Lewis and Clark, Chief Red Cloud, and Buffalo Bill Cody. 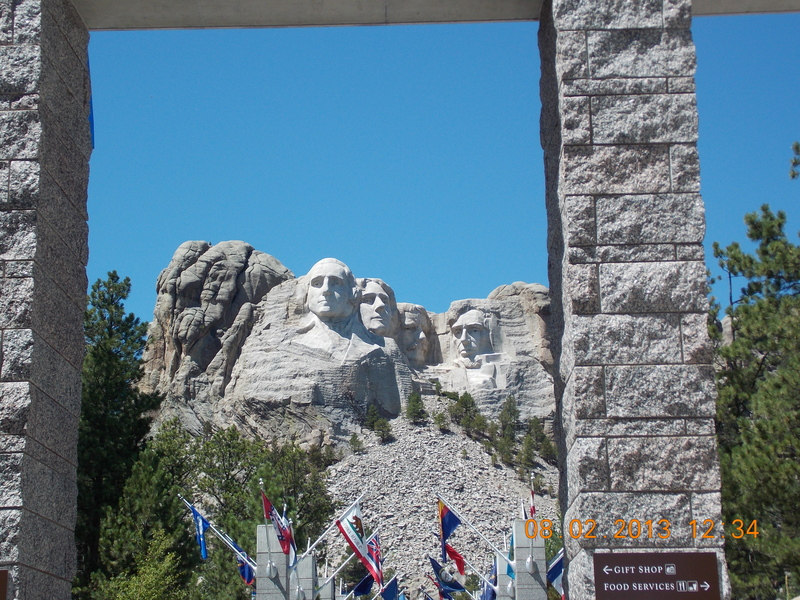 But Borglum felt that honoring the four Presidents made a better attraction. Congress agreed to match only $250,000 for the project and created the Mount Rushmore National Memorial Commission. Work began, and Rushmore became part of the National Park Service in 1933. Borglum, aged 60 when starting this project, worked on the project until his death in 1941, though the faces of the Presidents were done between 1934 and 1939. After his death, his son LIncoln Borglum took over. Lack of funds forced the project to end in October of 1941. The mountain was not always named Rushmore, after a prominent New York lawyer, named Charles E. Rushmore, who visited the area in the 1880s. Originally, the Lakotas named and called it Six Grandfathers, considered sacred by them. 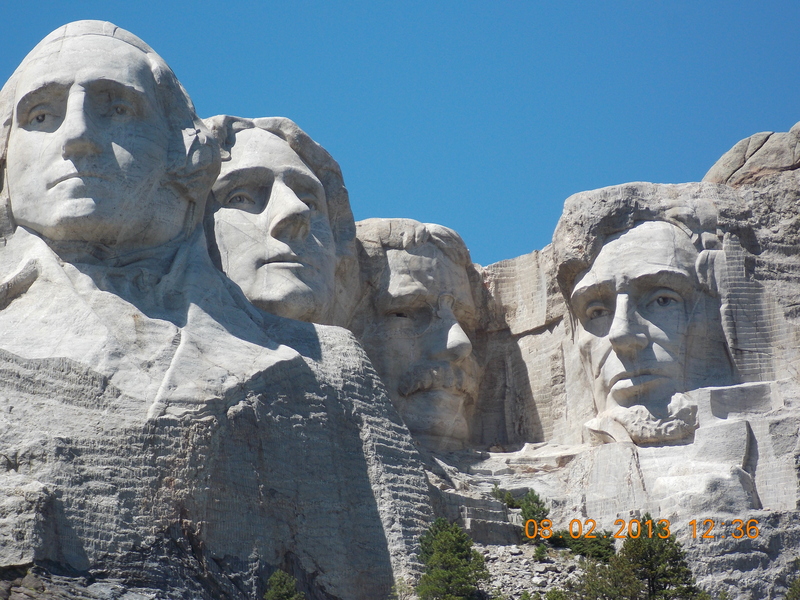 Between October 1927 and October 1941, Borglum and four hundred workers sculpted the four Presidents, who were chosen for their role in preserving the Republic and expanding its territory. Each President’s head was dedicated when completed, beginning with George Washington in 1934. This was followed by Thomas Jefferson in 1936, and Abraham Lincoln in 1827. Before Theodore Roosevelt was dedicated, a bill was introduced in 1937 to add Susan B. Anthony, contingent upon funding. I think you know the answer. The original design located Thomas Jefferson’s face to the right (our left) of George Washington. Borglum blew that up and carved anew after finding out about Jefferson’s relationship with his female slaves (just kidding, he did not know back then). But as far as whitewashing, in 2005, the memorial received its first bath. Workers spent three weeks power washing the dirt and lichen off of the monument. The entire project had a cost of $989,992.32. Contrary to popular belief, no workers (of the over 400) were killed during the construction. One was fired for yodeling! Unknown to me before this, a chamber exists behind the faces, containing sixteen enamel panels. The panels include the text of the Declaration of Independence, the Constitution, biographies of the four Presidents, and Borglum, and the history of the United States. In 1998, an upgraded visitor center was added. Mountain climbers maintain, seal and monitor the cracks. The budget does not allow for lichens to be removed. Mount Rushmore is composed primarily of granite, originating roughly 1.6 billion years ago. The faces sit at 5500 feet above sea level. Each President’s head is as tall as a six-story building. Each nose is over 20 feet long! Over 800 million pounds of granite were removed during the project, 90% with dynamite, the remainder with hand tools. Borglum was actually a student in Paris, who studied under famous French artist, Auguste Rodin. Of course, Mt. Rushmore is not without controversy, particularly by Native Americans, who owned this land before it was taken in battle. The Crazy Horse Memorial is being constructed elsewhere in the Black Hills to commemorate a famous Native American leader, and as a response to Mt. Rushmore. It is intended to be larger than Rushmore as well. Quiz: What direction do the Presidents face? I wonder which Presidents we would choose if Rushmore were built today. I am sure the very young, handsome, and popular President John Kennedy would be one. And the first African-American President, Obama would be another. To balance the two Democrats, I would expect Uncle Ronnie Reagan to be selected, along with the great war hero, Dwight Eisenhower. The Presidential Trail is a half mile walk which loops along the base of the monuments. This will be the best up close and personal look at the four faces. Also, admission is free, but there is a parking fee, way out here in the middle of South Dakota. Tourism is now South Dakota’s second leading industry. 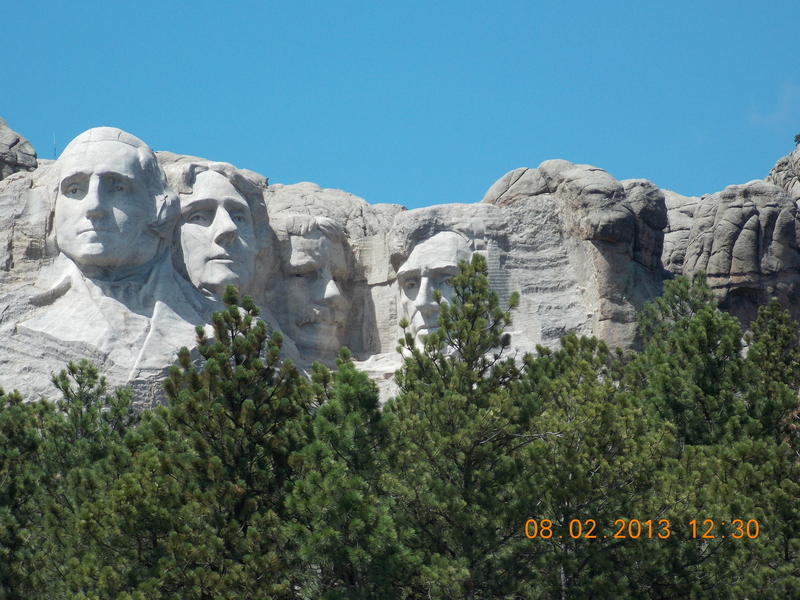 Mount Rushmore is the leading tourist attraction with nearly 3 million visitors per year. Many people come over during the Sturgis Motorcycle Rally, such as Rick and Chumley from Pawn Stars. It is an easy one hour ride on the old Harley each way. We plan to drive, in a car. I will say hello to Honest Abe, Tommy, Teddy, and Georgie-boy for you. Answer: Southeast, for maximum exposure to the sun. Sidebar: What if we could choose four women to have their faces on a stone mountain? Who would you choose? My choices would be Susan B. Anthony, Georgia O’Keefe, Amelia Earhart, and Rosa Parks. It is a rather difficult choice. Just came back from South Dakota. Visited Mt. Rushmore, Custer, Windcave and Badlands. It was an awesome experience. I feel like an American!